These highest quality brass Colorado spinner blades are available in a complete range of sizes. Correct in shape, size and design, these Colorado Blades are the result of many years experience in spinner blade manufacturing. 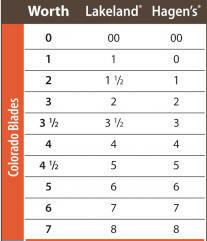 The smooth burnished edges of these super quality Colorado blades will not damage line or leader. Made from the highest quality brass, the Colorado blades are completely rustproof. All plated Colorado spinner blades are highly polished to give that extra sparkle in the water.